This year’s 1978, 40th reunion was held at the Johannian Club on Saturday evening, 24th March. Amidst several days of the most hectic rain seen in Joburg for many a year, amazingly enough the weather cleared completely for our reunion. The sun came out and it was a fabulous Highveld evening, bang in the middle of the local “monsoon”. First, let us say what a blast and once again – what a blast!! We could never have imagined such a spontaneous, fun-filled evening with the wonderful spirit and banter that prevailed throughout. Our only wish is that it could have gone on longer! 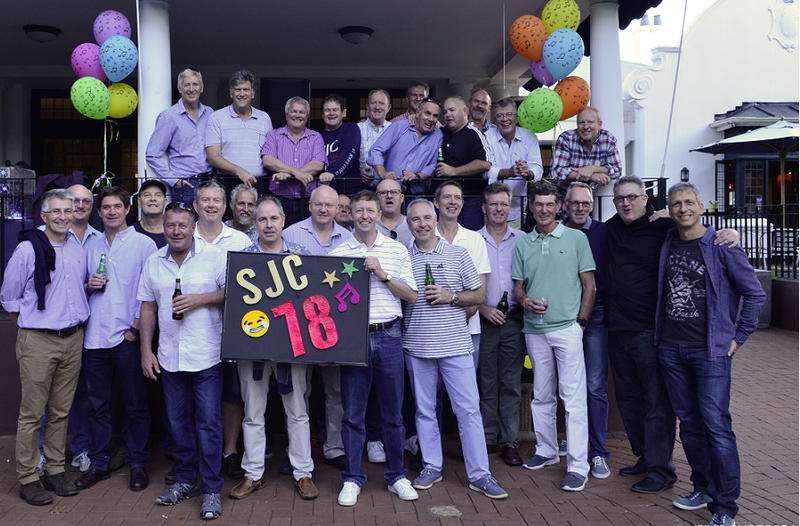 Our invitation went out to all those who had spent time with us during the Matric Class of ’78 era, regardless of whether they finished at SJC – including those from years above & below. Our mantra for an enjoyable event, was simply – good food, some drinks, great music and old school buddies! 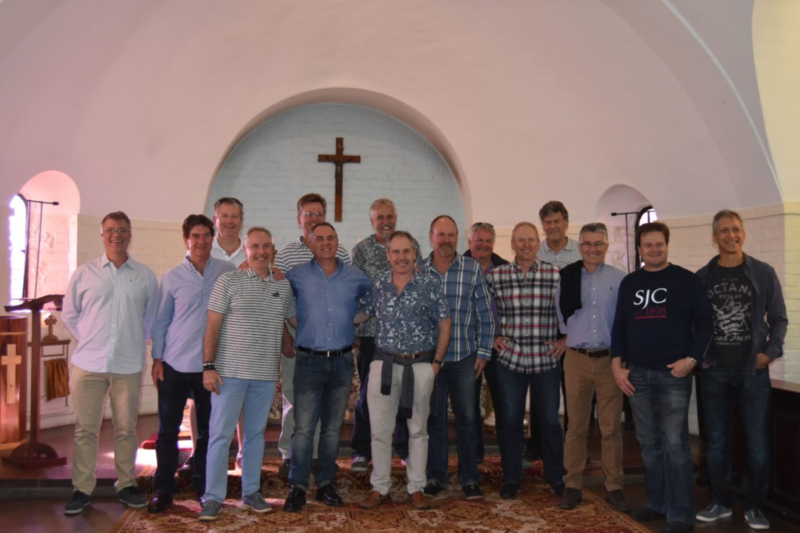 In the mid-afternoon a group of ’78ers participated in a fascinating and most interesting update tour of the St John’s Campus, kindly led by Clarke Housemaster, Dr Daniel Pretorius. The event started later in the afternoon, with drinks on the lawn in front of the main Johannian Club terrace. The celebration was designed as a casual, jeans and t-shirt affair with souvla kebabs flaming on open fires, prepared by the Johannian Club, and a few beers and wines to accompany the meal. Total number of attendees were around 60. The tally: 32 guys from the ’78 era, with Doug Armstrong (’77) and Guy Martin (’79) also joining us, together with 26 accompanying wives, partners, and a few next generation. The event pics were taken by John Wilson’s daughter, Kelcey, who is currently in Sixth Form at SJC. The Wilsons joined us from Dubai and Charlie Fish from London. Others came from all corners of SA. The event kickstarted with some informal chats and anecdotes with the “okes” from each of the organising committee present, Laurence Grubb, Alastair Koevort and Mike Visagie (who also organised a Skype hookup with some overseas guys – Vaughan Heberden in Mauritius, Guy Bannink in Tasmania. We had a few tech glitches connecting with Simon Vermooten in the US – so “Toots” ended up messaging us). Ian Tingle, also on the organising committee, unfortunately couldn’t join us on the day. The attendees prayed a rousing collective Class of ’78 rendition of the St John’s School Prayer midway. Mike also conveyed best wishes from Mark Palmos (UK), Kel Sheppey and Doug Lawson (US), Christos Scordis (Malawi), James Swemmer & Matt Ash (CT), Mark Giddy (Aus), Dave Stone (en route to Italy), Martin Christie-Taylor (Durbs), Nick Defterios & Pete Murray (NZ), Mark Pym (Canada). Messages and apologies for the day also came from Ian Tingle, Keith Litten, Gary Moran, James Swemmer, Tony Irish and Andrew Mobsby, all of whom were due to join us, but sadly for varying reasons were unable to make it. Our ’78 Kapitan, Cliff Elphick, concluded the session by sharing a few words and laughs with the team present and proposed a toast to friends absent and those passed on. Then to the strains of Bob Dylan’s “Forever Young” from his iconic 1978 Album – Live at Budokan (on original vinyl) – the music and party stepped up a gear. The playlist is too long for this brief (3 pages, goodness sake – sample…The Who, Floyd, Purple, Credence, BTO, Boston, Fleetwood, Queen, Stones, Sweet, ELO, Police, Manfred Mann, Rafferty etc. etc.) – we “jolled” into the night, Gang’78nam Style! From all of us, a simple thank you to everyone for their support, commitment, and the “Spirit of ’78” in making this one of the truly memorable and fun events of a lifetime. Fantastic!